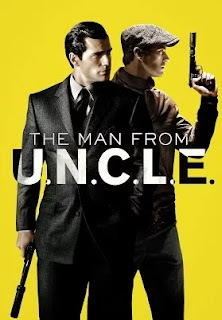 For the most part, Guy Ritchie's latest film comes quite short of the film it could have been. It's advertised as a version of the odd couple dressed up like a 1960's spy thriller. However, unlike his "Sherlock Holmes" films, Ritchie doesn't have the fun, exuberant personality of Robert Downey Jr. to keep this film afloat. Instead, two handsome hunks, in Henry Cavill and Armie Hammer, form the bromance (if you can call it that) at the center of the film. And Alicia Vikander (who was great in "Ex Machina" earlier this year) balances them out, or in some cases plays mother to them. To be clear these characters are not far off from being likable, but they're far flatter than they should have been. Cavill in particular gives a one note performance. He's the suave, debonair Napoleon Solo, a Bond-esque womanizer, which makes sense after realizing that Ian Flemming had a hand in creating the character for the original show. He is a master thief who, after having been captured for his crimes, was put to work as a spy and quickly became the CIA's top agent. Rotating back and forth between calm and enraged is Armie Hammer's Illya Kuryakin, a big strong man with daddy issues and a bad temper. He's Solo's Russian KGB counterpart. A spy at the top of his class. What this duo lacks, however, is a comic. Most duos include a comic and a straight man. Its what made the pairing of Robert Downey Jr.'s comical Sherlock Holmes and Jude Law's straight man Dr. Watson so fun and compelling. This film simply doesn't have it. They are, however, still capable of laughs from time to time. They mostly come down to these two over confident spies making mistakes and battling over who has the best spy gear. Yet they do feel like they're lacking that something to make them particularly special. They are, of course, from the two sides on the verge of nuclear war. In the post WWII 1960's, Russia and America shared control of Germany in two separate sides. The story here involves the remnants of the Nazi party attempting to get their hands on a nuclear warhead while Russia and America are distracted dealing with each other. However, they are not so distracted as to be blind to their activity. These Nazis, lead by Elizabeth Debicki's Victoria Vinciguerra are after Gaby Teller (Alicia Vikander) whose father has been captured in order to make them their coveted nuclear warhead. In a fun opening sequence, the two spies battle over finding Gabby and getting her out of Germany. Only later do they realize they'll be working together. Yet that's about all the story you need to know. The rest is fun spent with these characters and the dynamic that exists between them. While Illya and Gabby are an interesting twosome, having been paired for assignment as an engaged couple. He's fairly stiff, which is on purpose, yet the fact that he offers little else is something of a pain point here. His stiffness, or lacking personality, certainly doesn't warrant Gabby's eventual affections. Vikander on the other hand is only really given one scene to shine, which she does. It's a moment in which she attempts to have fun with Illya while being stuck in a hotel for the night. Gabby's charm does begin to show signs of breaking through Illya's tough exterior, but the film stops short of giving us anything more between them. However, as fun as their moment together in the hotel is, it's sadly about the only one she's allowed. If you're like me and you loved Alicia Vikander in "Ex Machina" earlier this year, you'll be surprised to find that even as an artificially intelligent robot, she brought more emotion and a finer sense of character than she does here. Even in a later moment in which she's asked how she is after hearing the news of her father's passing fails to illicit any sort of emotional response. I'm willing to peg her character's deficiency on the writing that tends to be more infatuated with the bromance between Napoleon and Illya. Gabby is often, sadly, relegated to the background. This is, of course, a Guy Ritchie film, and thus we're given numerous Guy Ritchie moments. However, unlike his previous efforts, these moments are rushed and poorly done. They are short snippets of scenes that confuse or trick the audience until the full scene is allowed to play out in its entirety some time later. The amount of time later these scenes play out range from several minutes to several seconds later. Normally a film such as this would have a few of these, and they'd be spread out enough to not warrant too much confusion while building tension and allowing the eventual "full version of the scene" to serve as an interesting plot twist. Here too often these snippets of scenes are separated by mere seconds to viewing of the full version of that scene. In short, the film is edited in such a way that it purposely deceives us for no other reason that to say, just seconds later, "look how clever I am." It is, in essence, too short a time later. It's altered structure for the sake of altered structure. Instead it feels like it's tripping over itself repeatedly in an attempt to be more clever than it needed to be. It's also needlessly over stylized. At least twice Ritchie tries to add visual style where it didn't need to be. This added visual flair also has no context within the film. The most obviously out of context example of this is the scene where the two spies infiltrate a warehouse and safe but find nothing there. The crux of this scene is that they've failed to find what they were looking for, yet the comic booky editing of combining multiple viewpoints on screen separated by black bars (as if panels of a comic book) is a strange attempt to add flair to scenes that didn't need it. In fact, worse yet, this flair works against the scene's humor of their efforts to find what amounts to an empty room. It serves only to skip the action. However the following scene also skips action, but in a different way that actually works while playing for humor. As the two spies flee the warehouse in a speed boat, the chase is missed as Solo is flung from the back of the boat but swims to the dock to find refuge in a nearby truck. Rather than follow Illya in the speedboat being chased around the harbor, we sit in the truck with Solo while the boat chase sequence proceeds in the background. It's seen in reflections on the glass of the windshield. The story, as complex as it is, is entertaining enough, but Ritchie's odd editing and some flat characterizations hold this one back from becoming as entertaining as it should have been. Hugh Grant shows up late in the film to add some life to the preceedings, and ultimately adds the necessary leader to this new network of spies. It's the start of a franchise, or at least the potential for one. While I didn't hate this film, as lacking as it may be, there is after all some fun to be had here, but it certainly didn't live up to the hype. But that wouldn't, however, keep me from seeing a second film. For a comedic spy thriller it falls short of Mission Impossible's latest entry, but lays the groundwork for what could be an interesting new franchise. I like the actors and the director, and there's certainly potential. Perhaps a second film could learn from the mistakes made here.